Shipping times are based on the method you choose at the time of checkout. USPS Priority Mail is 2-3 days and includes Saturday deliveries. No delivery on Sunday. UPS Next Day Air is guaranteed for Next Day, however, UPS does not ship on Saturday's and Sunday's. So if you order for Next Day on a Friday it will not arrive until Monday. UPS 2nd Day Air is guaranteed for 2 business days, however, UPS does not ship on Saturday's and Sunday's. So if you order for 2nd Day on a Friday it will not arrive until Tuesday. UPS 3 Day Air is guaranteed for 3 business days, however, UPS does not ship on Saturday's and Sunday's. So if you order for 3 Day on a Friday it will not arrive until Wednesday. UPS Ground varies according to your location. 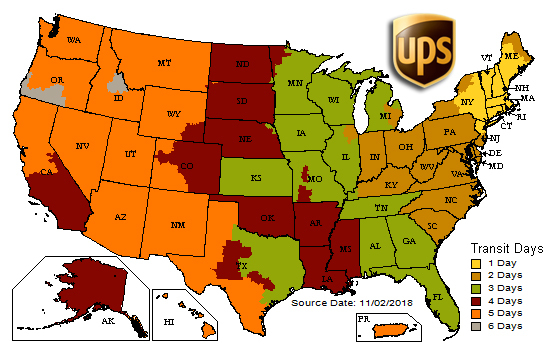 Below is a UPS map that shows a general representation of shipment time for Ground packages leaving our Holliston, MA warehouse. The map below is an estimated shipping time, please add one or two shipping days during peak shipping times around the holidays. The Same Day Shipping Guarantee applies to orders placed Monday through Friday (excepting holidays) on all goods that are in stock at our store/warehouse and at our affiliated drop-ship warehouses. Exceptions to this rule include scanners which are ordered with programming and firmware updates. Programming generally takes 7-14 additional days due to high demand; however, during holiday periods the time frame for programming may extend out further. Also, for coax cable orders, generally allow for an additional five days. On very rare occasions a product, particularly a very popular scanner or a specialty product that is produced in Europe, will go out of stock and we will not be able to fulfill this guarantee but we will do our utmost to fulfill the order as quickly as possible. Reminder, UPS Next Day Air is guaranteed for Next Day, however, UPS does not ship on Saturday and Sunday. So if you order for Next Day on a Friday it will not arrive until Monday. A different bill to ship to address orders may be delayed. UPS Ground, UPS Three Day Select, UPS Second Day Air and UPS Next Day Air. We are not able to guarantee same day shipping with United States Postal Services (USPS). To calculate shipping cost from ANY country just add the products you want to your shopping cart on our website and you will see the area below your items to Calculate Shipping Cost. Just plug in your City, State (if applicable) and Zip Code and click recalculate. It will give you live shipping rates and any available shipping options. Scanner Master hardware products are warrantied for 30 days from the date of purchase. Should you decide to return your scanner, we will happily refund your order using our easy and simple return policy described below. Return Process: Call us toll-free at 1-800-SCANNER prior to returning any products and receive a return authorization number. Put this number on the outside of the box. Upon our receiving the product, it will be reviewed to be sure it meets the Product Return Criteria requirements below and if so you will receive a full credit (excluding the shipping cost) for the returned items the same business day. Product Return Criteria: You must save all the packing materials, box, literature, accessories and the like in new condition. Products not returned in new condition, with damaged parts or missing packing or any scratches, defects or smell of smoke will be subject to a 15% re-stocking fee. Scanner Master reserves the right to refuse to refund or exchange any product where there is damage or defacement to equipment or packaging, or there are missing parts or packaging. Products eligible for return: Radios, cases, portable antennas, accessories, and certain other equipment may be returned for a refund within 30 days of delivery. Products NOT eligible for return: Books, Scanner Master Guides, and batteries are not returnable for refund. Software CD's or Downloads are not returnable. All coax cable is not returnable. Special order items such as government version radios are not returnable. AOR and Unication receivers cannot be returned for credit, only exchange if defective within the first 30 days. These receivers must also meet the Product Return Criteria as stated above. Base station antennas are only returnable if unopened. Shipping Cost: Shipping fees are not refundable. Pre-Made (Holiday) Packages: If packages include Setup and Optimized or HomeTown Programming these services are not refundable. Online subscriptions such as RadioReference and Race frequencies subscriptions are non-refundable. Easier to read manuals, quick reference cards, and directories booklets are non-refundable. Programming Returns: Programming charges, consulting fees, and other labor fees are not refundable. If you have any problems or concerns with any work performed by Scanner Master please contact us and we will do our best to resolve the issue, however, agreed upon costs for programming or other labor services are not refundable at any time. For more information on Programming, returns see our Programming Terms and Conditions. International orders: International orders cannot be returned or refunded. Customers who order internationally will have to pay all local customs, duty, brokerage, and taxes. Customers who refuse international orders will have to pay all shipping costs (for delivery and return) and all customs, duty, brokerage fees, and taxes which are still required. Shipping Carrier Notes: Occasionally orders are held up with the shipping carrier due to adverse weather conditions. This is beyond our control and we do not guarantee delivery times under these circumstances. Any returns or cancellations due to late arrival because of this condition will not be credited freight cost back and will also be responsible for delivery charges back to us if the items are refused upon delivery. Uniden Warranty: Uniden has a one-year parts/labor warranty on all their products. Keep your receipt should it be necessary to return the product under the warranty. Other Manufacturers Warranties: Refer to the radio manufacturers for complete warranty information. SpectrumForce Warranty: Scanner Master hardware products (SpectrumForce) are warranted for 30 days from the date of purchase. SportSync Radio Defect Warranty: SportSync Radio hardware products are warranted against manufacturing defects for 90 days from the date of purchase. Sales of new or used products: All products are brand new and in the manufacturers original packaging. We do not sell refurbished products. Multiple Returns: Scanner Master reserves the right to refuse returns from customers who purchase and returns the product at what we deem to be an excessive rate (more than twice or three times). This is entirely at Scanner Master's discretion.